Powers/Abilities: Ernest W. Rockworth is a businessman with criminal connections, including thugs who work for him. (Daredevil I#145 (fb) - BTS) - Corrupt businessman Ernest W. Rockworth demanded the legal services of Matt Murdock, an attorney at the Storefront. 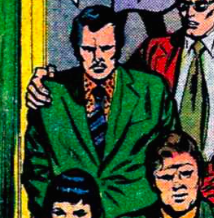 (Daredevil I#145) - When Murdock didn't get back to Rockworth, Rockworth showed up at the Storefront, interrupting a meeting with Mr. Santiago, Foggy Nelson, and Heather Glenn. Murdock called Rockworth corrupt and refused abjectly to help him. Rockworth left in a fury, promising revenge, though he told his stooge Crespi not to intervene. Comments: Created by Jim Shooter, George Tuska, and Jim Mooney. 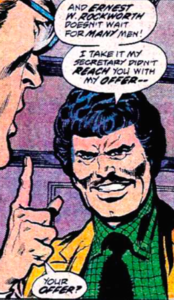 (Daredevil I#145) - At the Storefront, when Matt Murdock refused to help Ernest W. Rockworth, henchmen Crespi offered to "lean" on Murdock, but Rockworth turned him down. (Daredevil I#145) - A legal client at the Storefront, Mr. Santiago waited anxiously with Foggy Nelson and Heather Glenn for the arrival of Matt Murdock, who was blind and said he was late due to the snowstorm. As Santiago apologized, Ernest W. Rockworth demanded Murdock's services.